Have you ever wondered why Thanos in Infinity War, was able to defeat all of the heroes? Well, Thanos had a few edges over everyone but his main weapon, was his conviction. His willingness to go All In, his ability to dominate, and his commitment to what he believed in. Along with, the actions he took to accomplish his goal. All of those things, are the exact recipe needed to help you reach your next comma. you, and possibly your team, can follow so every day is maximized success. You need to stick, and believe in the plan. Without this, it falls apart, and you won’t give your all while executing the plan. You need to commit to massive, imperfect action. Reaching your next comma is going to take, more action then you’ve ever committed to before. To achieve any goal, your actions, must match your vision. Finally, you need to have the insight for the future. What changes will you face? How will you encounter them? How far are you willing to go, to create the dream you envision? 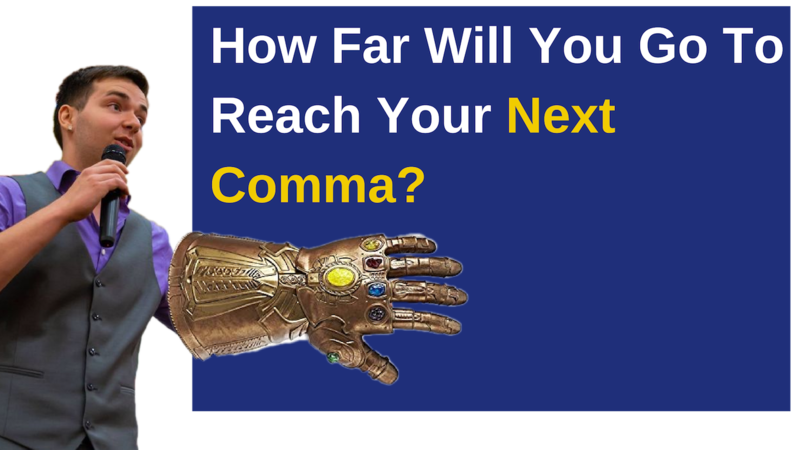 To reach, your next comma. As Thanos did, “You must risk it all”. That might be the one thing, keeping you from reaching your next comma, and beyond.